Web Help Desk® by SolarWinds® is a web-based automated ticketing solution that helps you manage your IT support requests for both internal and external clients. Use Web Help Desk to create and manage tickets through the web console. It also supports email ticket creation, automatic ticket assignment and escalation, asset management, and incident and problem management. All help desk processes are managed through the web console. After you set up the application, you can configure Web Help Desk to perform specific tasks. These tasks include routing tickets to a specific help desk technician or work group and creating new tickets from email requests or alert messages from a supported monitoring application. Web Help Desk includes an extensive library of FAQs, integrated tool tips, and online help you can access from the Web console. See the Web Help Desk documentation website for additional information. You can create a ticket checklist to ensure that all ticket tasks are completed before a ticket is closed. Techs can create an ad-hoc checklist from within a ticket or an administrator can create checklists templates to automate your ticketing process. Checklist templates can help you automate your ticketing process by ensuring that all steps are completed before the ticket is closed. To automate your ticketing process, an administrator can create a checklist template and assign the template to new request types. This process ensures that all techs have a consistent list of checklist items to complete for each request type, as well as reduce the overhead of child tickets that provide the same functionality. You can archive a request type in the Web Help Desk Administrator Console. This process archives the request type and all associated tickets so they are hidden from clients and techs. When an administrator generates a report, the request type and associated ticket information are included in the report. The archived request type is appended with [A] in the reports and dashboard widgets. You can remove a request type from the archive by clearing the corresponding checkbox. The archived ticket data does not display in the dashboard widgets. You can link multiple service requests to one parent ticket to address a repeated issue or task (such as on-boarding a new employee or tracking your IT projects). You can also pass notes, attachments, and custom fields between parent and child tickets to share data to relevant tasks. You can generate help desk tickets manually in the user interface or automatically by emails from any third-party monitoring tool. You can also create tasks to link a ticket automatically to an existing ticket that triggers an action rule. If you are running DameWare® Mini Remote Control (included with SolarWinds Help Desk Essentials), you can establish a remote connection and troubleshoot a client system directly from a ticket or asset and save remote session details into a new or existing ticket. Using Windows Management Instrumentation (WMI) or supported third-party discovery tools, you can search a specific IP address range in your corporate network and create a list of client assets (such as computer systems, installed software, and attached peripherals). When asset discovery is completed, you can use DameWare MRC to connect remotely to a client system, troubleshoot the issue, and append remote session information to a new or existing ticket. You can manage change control in your organization using automated approval processes. These include creating approver roles, assigning departments and clients to approver roles, and configuring approval processes. If the ticket is not resolved within a preconfigured span of time, Web Help Desk can escalate the ticket and send an SMS alert to the assigned help desk technician. Additionally, when you create new tickets, you can send notes to the end user to provide status or request additional information. You can configure your deployment for FIPS 140-2 compliance cryptography. This configuration is required for computer systems installed in U.S. Federal government agencies and companies in a regulated industry (such as healthcare and financial institutions) that share and distribute sensitive but unclassified (SBU) information. The following illustration provides a high-level view of Web Help Desk in a stand-alone installation. 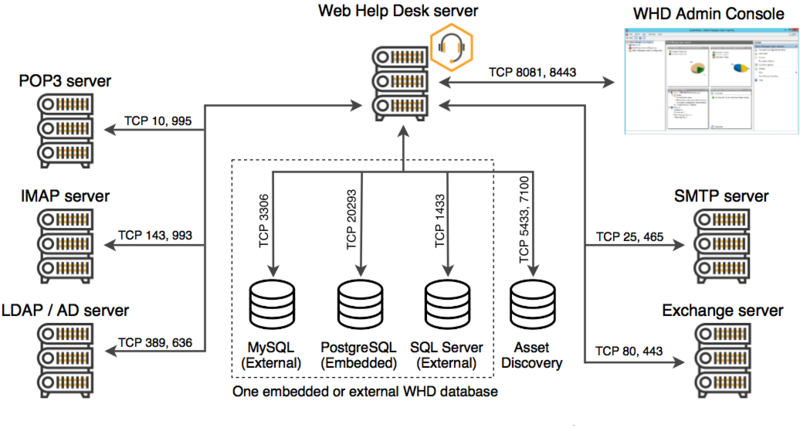 In this example, Web Help Desk is installed on a dedicated server with your choice of an embedded PostgreSQL database or an external database such as MySQL™ or Microsoft® SQL Server®. Beginning in 12.5.1, the Web Help Desk Admin Console uses secure port 8443 by default to connect to the Web Help Desk server. 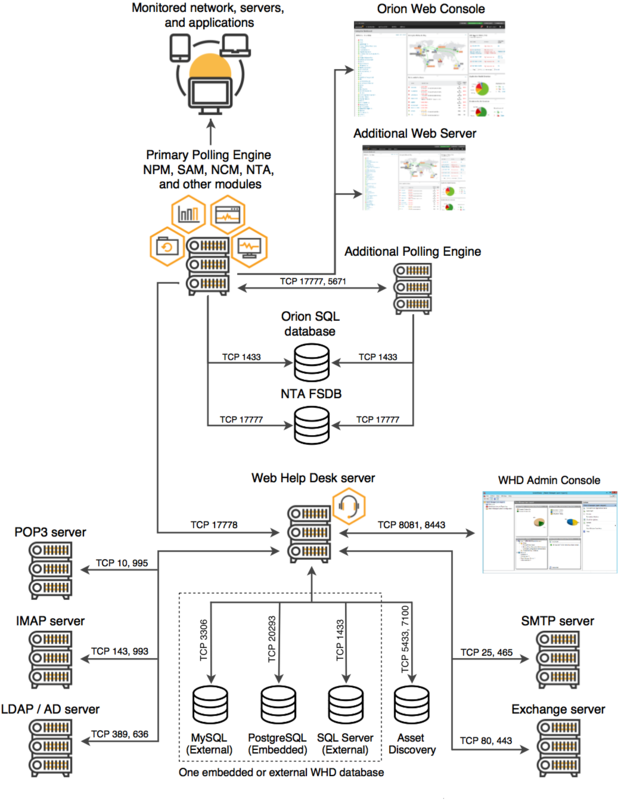 The following illustration provides a high-level view of a Web Help Desk stand-alone installation integrated with the Orion Platform. This configuration links Web Help Desk to SolarWinds Network Performance Monitor (NPM), Server and Application Monitor (SAM), and Network Configuration Manager (NCM) systems to automatically create new tickets from Orion platform alerts and dispatch the appropriate techs to address the issue.